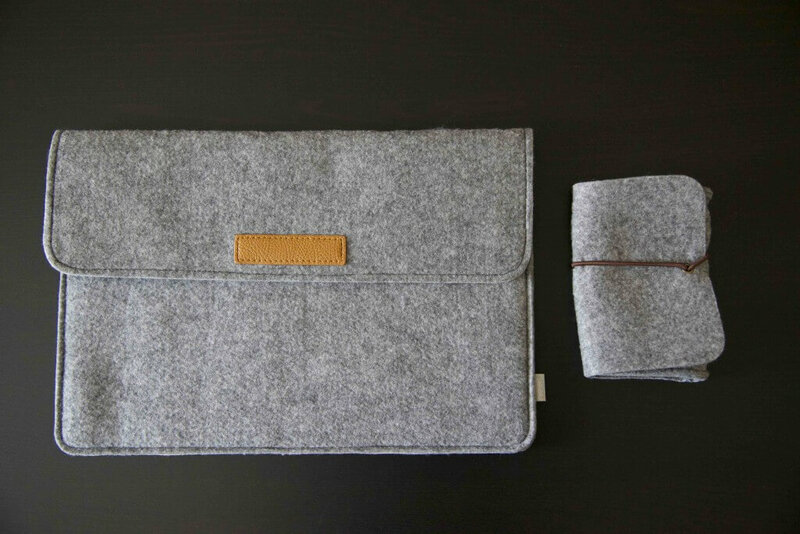 Inateck laptop sleeve and included small felt case. You can find the Inateck Laptop Sleeve here on Amazon.com. Also, you can get the Inateck Laptop Sleeve here on the official Inateck website. With its unique felt exterior and hard to beat price tag, the Inateck laptop sleeve is a sleeve to consider using when traveling. 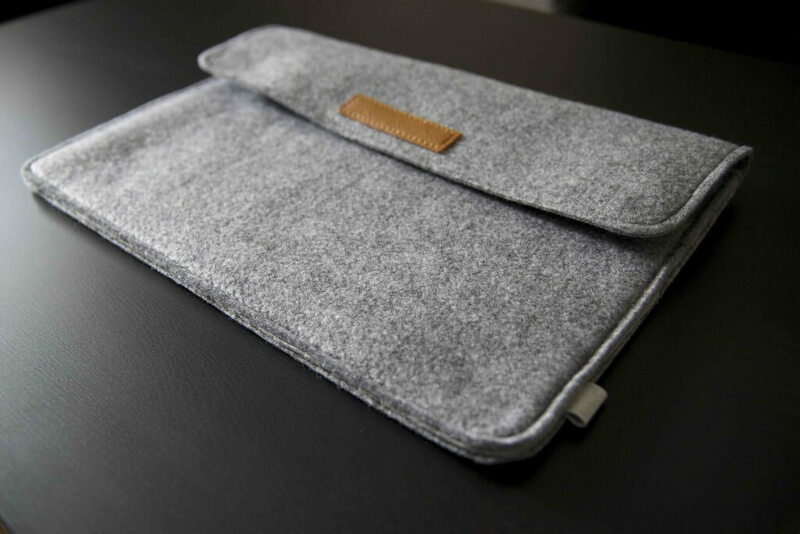 The laptop sleeve is made of a soft light grey felt and fits a 13.3 inch MacBook Air snugly. The sleeve was made specifically for MacBooks, however will fit most ultrabooks and other thin laptops in the 11 to 13 inch range. Unlike other generic laptop sleeves such as the Case Logic laptop sleeve, the Inateck laptop sleeve fits my MacBook Air like a glove and prevents it from shifting around when on the go. The inside lining of the sleeve is made of a soft microfiber like material, which prevents scratches. 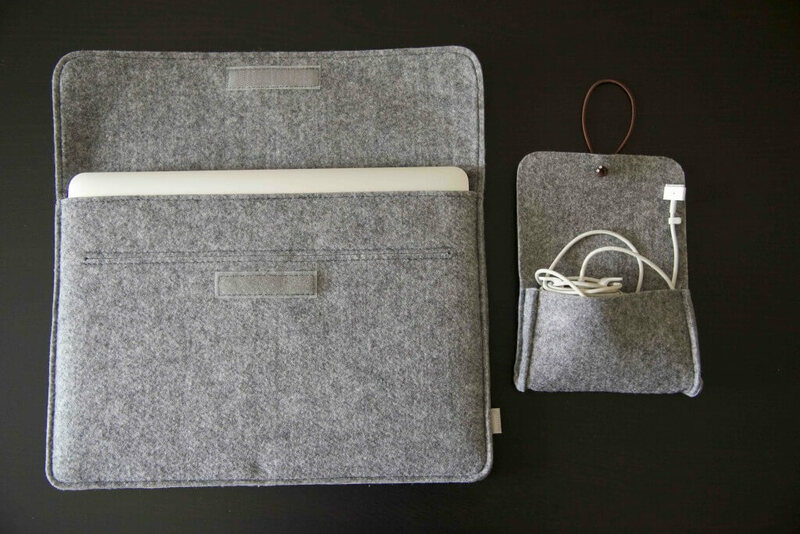 The sleeve also has 3 low-profile pockets in addition to the main compartment for the laptop. The first pocket on the front of the sleeve is large enough to fit an iPad 2 and most other tablets. 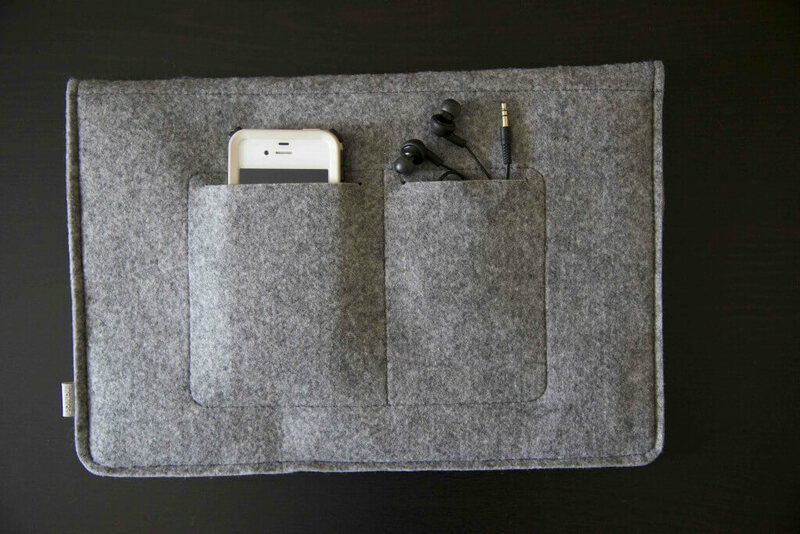 On the back of the sleeve there are also two smaller pockets, which are perfect for putting your phone or earbuds in. Like the main compartment, the tablet compartment and two back pockets are also lined with a microfiber like material. 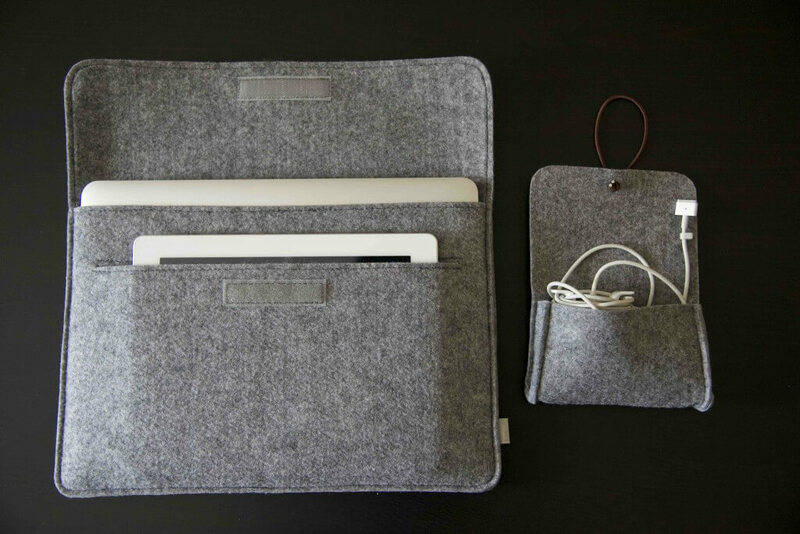 The laptop sleeve by Inateck also includes a bonus felt carrying case to hold chargers or other accessories. My MacBook Air charger fit perfectly in the carrying case. Since this sleeve was made specifically for MacBooks, you may not be able to use it for other thicker laptops. However, thinner ultrabooks should be able to fit in the sleeve. The laptop sleeve bulged until it couldn’t close when I packed both my iPad 2 and 13 inch MacBook Air. The Velcro closures couldn’t match due to it being so tightly packed. I would recommend for Inateck to make two Velcro strips, so the sleeve could seal at either of the two different points depending on how full the sleeve is. Though the Inateck sleeve will protect your laptop from scratches and other minor damage, the sleeve isn’t completely protective. The felt padding is thin, making the sleeve lightweight and compact, but not shock absorbent. The sides and corners of the sleeve are not too padded, meaning your computer could be dented or damaged if subject to impact. While the Inateck sleeve is not completely protective for drops, not many sleeves on the market are either. At $16 (on Amazon.com), the Inateck laptop sleeve is a well-priced product packed with several useful features, but not too protective. I would recommend this product to travelers, and anyone in general who won’t be planning on dropping their laptops. Some links found in this review are affiliate links, meaning that we get a commission if you decide to make a purchase, at no additional cost to you. We would never endorse a product or service we didn’t actually use and believe in. Also, the Inateck Laptop Sleeve was provided for this review. As always, this review contains only my honest views and opinions. « What does mAh mean for external batteries and smartphones? What does mAh stand for? Hola Fernando. Creo que si el MacBook Air tiene un estuche protector, aún caben dentro de la manga. Pero va a ser apretado. продаётся ли такой чехол где-нибудь в России? Я не уверен, если вы можете найти это точное дело в России. Он продается только на Amazon.com. Я думаю, вы могли бы, вероятно, найти похожие случаи, хотя.